When I was living in Philadelphia, after attending art school and between jobs, I wandered down the street to a bookstore with its doors open. In a massive pile was the first edition of the book “The Philosophy of Andy Warhol (From A to B and Back Again).” I bought the book. This very famous artist, Andy Warhol seemed so accessible! We think alike! And how far is New York from here anyway!? After a bold moment of courage, I called Andy Warhol Enterprises in Manhattan. The man answering the phone was very nice. I wanted to work for them, I said. In the Art Department of Interview Magazine. He said, please send us a tape of your voice. Andy would really like your voice. So I did. But as the saying goes, I never heard back from them. And, to be honest, I was a little afraid of The Factory and all the goings-on there. Not the man himself, but those who associated with him. I never pursued it. After reading subsequent books of Warhol’s, I learned that he kept time capsules. Andy Warhol was an organized hoarder, much like I am. That everything he received by mail or that which was given to him, he put in a box, marked with the year. 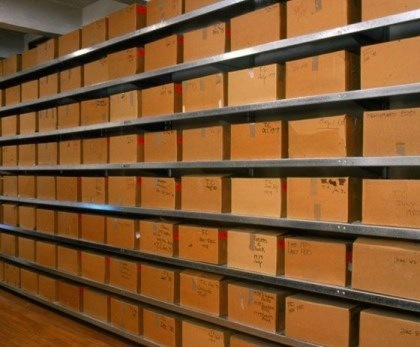 When he died, the time capsules were put in the soon to be built Andy Warhol Museum in Pittsburgh, Pennsylvania. My voice is in the Andy Warhol Museum!